Looking for a healthy lunch idea you can take to work? Grab your favourite thermos, friend! This low FODMAP roasted red pepper soup is so delicious you’ll forget it’s low FODMAP! Seriously, this low FODMAP roasted red pepper soup is absolutely fantastic! Aside from the stunning colour, it has a deep, rich flavour you’ll be craving all year long! Think roasting peppers and peeling sounds too involved? Don’t panic! To prep the peppers, broil them on the middle rack for 15 minutes. Then, stick them in an airtight container for 10-15 minutes. The steam will loosen the skins enough you can just pull them off! PS! The secret to seeding peppers quickly is to use a spoon! Start by cutting each pepper in half and gently popping off the stem with your fingers. Then, take a soup spoon and scoop out the membranes and any seeds. Done and done! 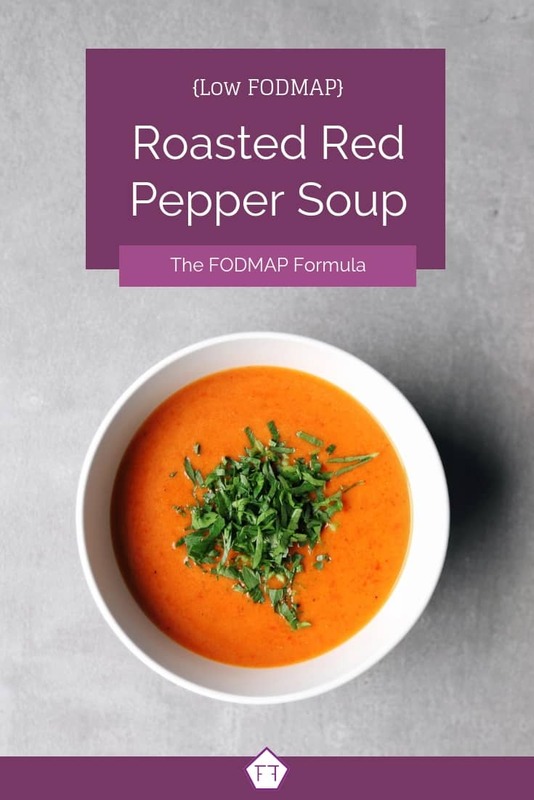 Think this low FODMAP roasted red pepper soup sounds great, but you don’t have time to try it now? Don’t worry! You can PIN THIS POST for later! 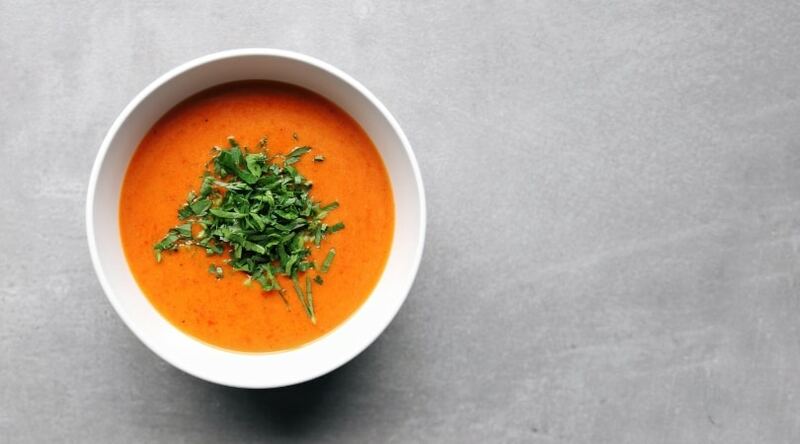 This low FODMAP roasted red pepper soup will rock your socks! Check out the notes below for tips on keeping this recipe FODMAP friendly! First up, peppers. According to the Monash app, red peppers don’t have any FODMAPs. So, these won’t add anything to your FODMAP load. But, heads up! Even though red peppers don’t have any FODMAPs, they get their bite from a chemical called capsaicin. This can cause heartburn in some people. So, if you have a secondary issue like GERD or dyspepsia, start with a small portion and see how it goes. Next up, leeks. According to the Monash app, the green part of a leek is low FODMAP in servings of 2/3 cups per sitting. Servings of 1 cup or more are high in the polyol mannitol. Our recipe uses 1/2 a cup of leeks, which works out to 1.3 tbsp per person. This is well within Monash’s recommended range. We’ll also be using chicken broth. For my Canadian peeps, both Campbell’s and GoBio both have low FODMAP chicken broths. If you can’t find a FODMAP-friendly brand at your local store, you can either make your own or grab this Monash University certified chicken soup base from Fody Foods Co.
Last but not least, sour cream. If you’re in the elimination phase of the Low FODMAP Diet, you need to use a lactose-free sour cream. For my Canadian peeps, both President’s Choice and Gay Lea have lactose-free sour creams. 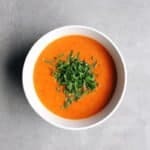 Want to try this low FODMAP roasted red pepper soup? Don’t forget to PIN THIS RECIPE for later! Looking for a savoury lunch idea? 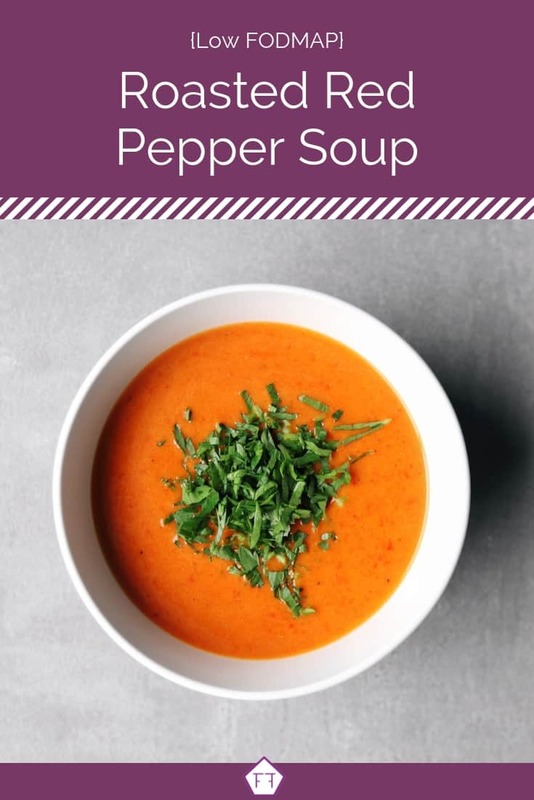 This low FODMAP roasted red pepper soup is exactly what you need! Preheat your broiler on high. Line a large baking sheet with foil and lay out your peppers, cut side down. Broil on the middle rack until the skins are blackened (about 15 minutes). Then, put the peppers in a sealed container or Ziploc bag for 10-15 minutes to steam the skins off. Warm up the oil in a large saucepan, then add the leeks and cook until tender (about 3-5 minutes). Then, remove the peppers from their container and pull off the skin. You don't need to get all of it off, but make sure you remove all the black parts. Add the peppers, chicken broth, salt, and pepper to the pot. Cover the pot and simmer for 20 minutes. Then, carefully blend the pepper pieces into the soup using an emersion blender. Remove your pan from the burner and add the sour cream and oregano. Stir to combine. This recipe is excellent warm or cold! This hearty low FODMAP roasted red pepper soup will warm up your insides all winter long! Did you like this recipe? Don’t forget to share it! Together we’ll get the Low FODMAP Diet down to a science! Low FODMAP Tomato Soup With a pinch of fresh basil and a splash of cream, this hearty tomato soup is full of flavour but light on FODMAPs. Ready in under 15 minutes it will warm you up in no time. Low FODMAP Leek and Potato Soup Looking for an easy lunch you can eat on-the-go? Grab your thermos, friend! This low FODMAP leek and potato soup is the perfect sidekick for a cold winter day.